If you’re like a lot of businesses, you’ve heard of the Cloud and generally know what it means, but haven’t considered why it might be right for you — especially if you’re an ERP or CRM user. Like those clouds in the sky, a little daylight goes a long way to clear things up. Because of their size and complexity, IT systems and servers are ideally suited to the cloud. Whether you’re considering a change now or down the road, the reasons for moving your business applications and data to the cloud are compelling. Perhaps you’ve outgrown your current system or it’s just time to upgrade and leverage the benefits of modern ERP and CRM. That usually means buying new hardware (servers, network equipment, etc), along with bearing the costs of set up, configuration, and ongoing support & maintenance. When you consider the cost of buying new hardware or replacing aging IT infrastructure, sometimes it just doesn’t make sense. With Cloud-based technologies, you’re using state-of-the-art servers and equipment that are always up to date, along with high-end performance that doesn’t cost an arm and a leg. If you’re a start-up or small business that needs to upgrade from QuickBooks, you’ll probably need heavy duty hardware and IT systems that can not only grow with you, but also accommodate the requirements of a new ERP or CRM system – and that’s a potential budget killer. When you chose a Cloud solution, you won’t have to make that debatable investment (and no matter how wisely you choose, your infrastructure will eventually become obsolete). Instead, you’ll have enterprise-level IT driving bigger profits and sustained growth at a price you can afford. Cloud ERP and CRM solutions level the playing field and prevents a lack of IT infrastructure from blocking the growth of your business. Enterprise system support costs can be prohibitive, whether you have someone full-time in-house or pay an outside IT consultant by the hour. With Cloud-based ERP and CRM, you don’t have to pay for technicians and IT support specialists that you aren’t fully utilizing. Sometimes the peace of mind that comes with simplifying your IT needs is just as big a payoff as the money you save. By eliminating maintenance worries associated with IT systems – hardware, backups, upgrades, downtime, and more – you’ll do more than reduce your IT support needs and expenses. You’ll get back to focusing on and growing your business without all the technical distractions. And about that backup thing ... automatic data backups are usually built in to most cloud solutions, so that’s one less thing to worry about. With Cloud-based ERP and CRM solutions, you get built-in remote access to your applications without the added cost and complexity of managing a Virtual Private Network (VPN) or remote access servers/software. If your business operates in multiple locations, has home office workers, or sales people that are always on the road, you’ll benefit from the convenience of mobile access to your ERP or CRM system – from any device or platform - without buying specialized hardware or software. It’s easy to see that advocates for cloud-based business solutions are doing more than just selling blue sky. 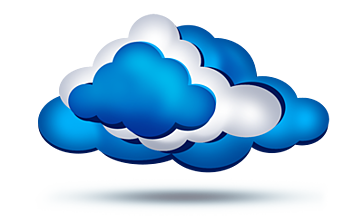 In fact no matter what size your business, a little cloud cover may be just what you need.